Where does one begin. How can one explain the feelings and emotions while visiting a place of sadness and happiness, stress and anger. That was pretty much how I felt throughout my visit of the refuge camp yesterday in Calais. The determination and drive of these people is inspiring and very eye opening. Some have traveled for weeks, even months to get where they are now. They risk their own lives to seek a better, safer future for their family. Myself and Hiren Koyani went over to Calais for the day to uncover more about the international situation. Most, in fact nearly all we had spoken with came from troubled areas in the world including Darfur, Afghanistan, Syria, Iraq and Eritrea. We chose not to ask questions which could cause discomfort, however, we did one interview with a group of young men which can be viewed above. Something I really wanted to pick up on from this report was the positives from the camp and if you like, the “community spirit” and atmosphere I felt throughout my visit. While the charities were donating food, you would be surprised by the amount of order and calmness everyone brought about during times I would have thought would be the most manic and stressful. 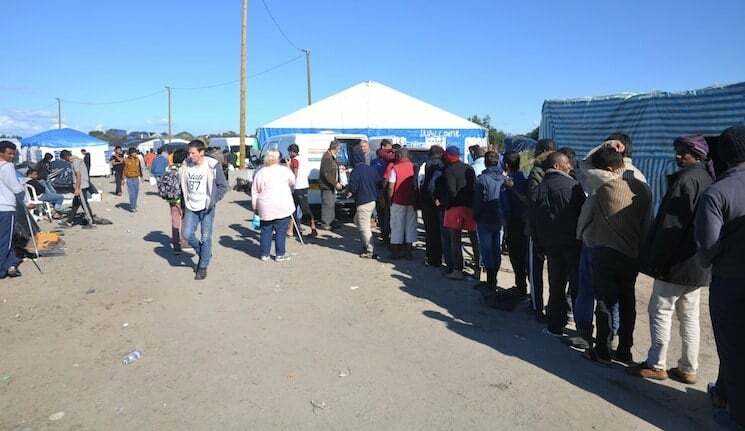 Each time a van pulled up and started handing out boxes or bags full of food, the entire camp would of course rush to the vehicle, however after a few moments they would start to form a queue. Now as I remembered in secondary school, there was no chance of an orderly queue, people would push and shove just to get the first portion. Now, to my surprise, this was the complete opposite on the camp. Picture: Refugees queuing for food, which is being handed out by a local charity. The Camp has been developed in a way to suit the refugees living there. In the ‘Jungle’, the refugees have built a church, mosque, shops, a book store and even a night club. However, the living standards including personal hygiene is lacking, tremendously. Toilets have been placed around the camp which I believe where given by an international aid charity, but the maintenance and care of the facilities is unheard of. A basic human right is the access to facilities where one can clean and remain healthy and free from disease. This is something I struggled to see here. Close by to the main camp is the Jules Ferry Centre. Here the women and younger children stay. This area is fenced off from the main camp preventing the men entering. However the people who operate the centre open up the gates at certain times during the day to enable the men to gain access to shower facilities there. However not all women and children stay in the secure centre, many do stay in the main camp where no protection is enforced. The current statistics and facts about the camp are mind blowing. A recent estimate from The Telegraph [News Article] revealed that there is roughly 4,000 refugees living in the ‘Jungle’. All facts and figures can be found via The Telegraph article above.